The EHP remote display receives weighing data from the any EHP crane scale fitted with a wireless interface from distances up to 500 m line of site. The displayed character height is 150 mm or 250 mm depending on which option is chosen and is suitable for both indoor and outdoor use. 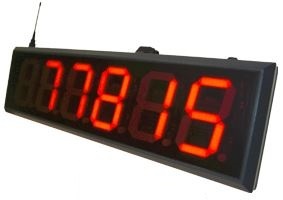 The data displayed can be read at a distances of over 200 m, with simple installation, only a local power supply is needed once the units have been linked together.